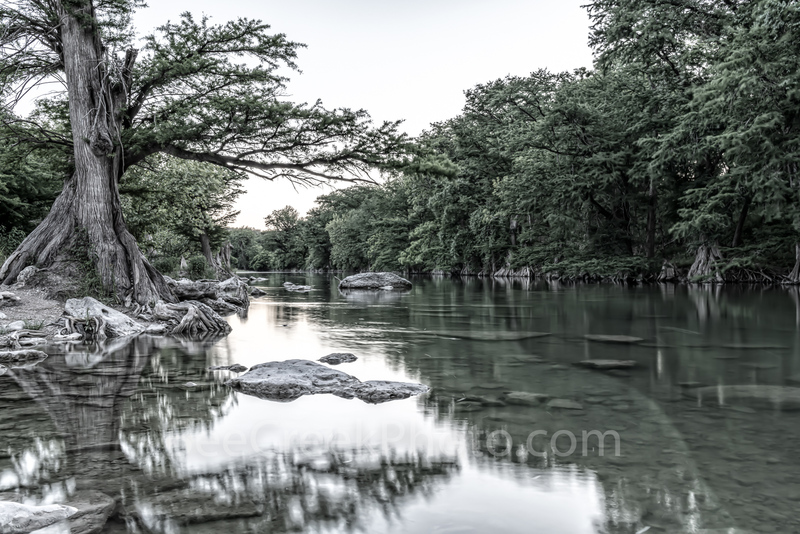 Guadalupe river in black and white with a hint of green as it runs through Guadalupe State Park as the late afternoon sun goes below the trees but just enough light to see the river rocks in the water and the cypress trees along the pebbles beach looking to plant their roots down deep. These large cypress trees have the most spectalucular trunks that seem to twist and turn in such a way that they look surreal in black and white not to mention these wonderful roots as they spread out on the ground along the river bank looking to get a good strong hold before the next flood. Photo © copyright by Bee Creek Photography - Tod Grubbs / Cynthia Hestand.